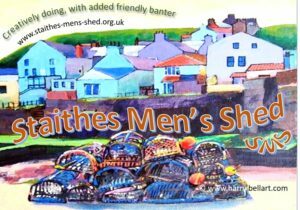 We are getting promotional postcards prepared for Staithes Men’s Shed (to go with the deck of cards for other Sheds!) and wanted something that said “STAITHES”. Could have been Old Jack’s Boat but on a visit we noticed all the crab pots and floats. That seemed very appropriate for a bunch of crabby men! Looking with Google for images of crab pots (many American style ones) we came across a wonderful (IOHO) picture by Tyneside artist Harry Bell. 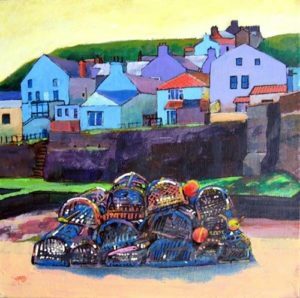 Staithes beach, harbour wall, houses and a pile of pots! Lovely colours too. We sent off a request to Harry to use his work as the backdrop to our message and he readily agreed, having educated himself in what a Shed was in our context. We have a couple of occasional artists in our Shed ranks already, Don and Sue. Thanks for your email sent via Gateshead Art Society. I confess you lost me at “Men’s Sheds” but Google helped me out and I think it’s a great idea. Good luck with establishing the new one in Staithes and I’ll be happy to loan my image without a fee if you think it’s suitable. We greatly appreciate Harry Bell’s kind gesture. It is an example of what we hope will happen as Sheds (and other inclusive activities) become centres of community involvement by businesses too. Businesses are people, of course.